I was inspired a couple of summers ago to look into some old textile designs from the early Soviet period I'd seen in a book long ago in Budapest, and it inspired me to look into new designs in wallpaper. I was blown away by the burst of recent creativity in the field and realized there are a lot more choices than what I grew up seeing in the 70s and 80s. From updates on traditional themes to entirely new, whimsical papers, I'm officially "all in" for wallpaper these days. I recently completed a fully lined installation of Cole & Son "hummingbird" paper in a complex dining room in Bethany (photos to follow soon) and am definitely looking forward to more challenges! Ask the Painter Chick! I think anyone can do a great job painting, but there are a lot of tips and tricks that save time or improve the end result. Send me an email via the contacts page, and if I have an answer or suggestion, I'll post it here. All images by Christina Crowder unless otherwise noted. Fine house painting and wallpaper in Hamden, CT with C. Crowder Painting: Interior and Exterior Painting, Color, & Design, wallpaper installation and removal. 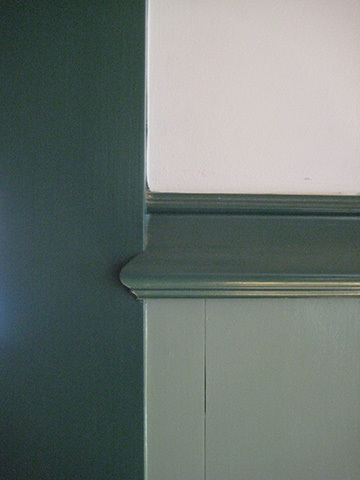 Express your colors and your style with quick, reliable , high-quality painting services in the greater New Haven area.